On Saturday, October 21, 2016, twenty anti-terror police accompanied by a news crew raided a block of five flats in Aksaray, Turkey, that belongs to my father, Ömer Keleş. Within an hour, the story featured in no fewer than thirty media outlets, across Turkey. Doğan Media (DHA) and Ihlas News Agency supplied the story to the Turkish press. DHA and Hürriyet ran the story as “Police operation against villa of Fethullah Gülen’s right-hand man”. Hürriyet’s story says that I, Özcan Keleş, am Gülen’s right-hand man; that I was spotted in footage taken a day after the coup in Pennsylvania tending to Gülen’s medical needs; that I live in the US; that my father is the movement’s UK leader (“imam”); that there is an arrest warrant for my father and me in Turkey; that I have a three-storey villa in Aksaray; that the villa was empty when raided and that the police discovered many empty safes including hidden ones in the walls and floors on every floor of the villa; that a firearm was recovered from the villa; and that the villa’s CCTV cameras and “advanced” alarm system were particularly telling. Hürriyet ran this story and the headline without using qualifications such as “alleged”, “so-called” or quotation marks. Doğan Media Group’s Show Haber (popular TV station) featured the story on its evening news, superimposing images of my father and me on footage of the police raid, describing the villa as “mysterious” and saying that the raid had discovered “secret artefacts, sections and secrets”; that I never left the side of Gülen; and that I lived in the US for years. Other variations were added to the story by other media outlets. 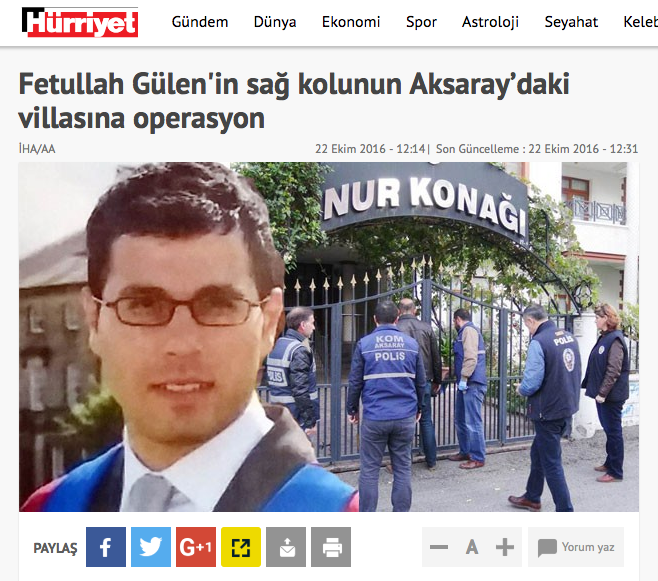 For example, Akşam ran the story as “Gülen’s right-hand man ran away with the cash”. Haberbedava said that I made my first appearance before a camera when I was spotted tending to Gülen a day after the coup; that the mystery around my identity continues; and that my attempt to discredit Turkey to foreign media through my critical English tweets is telling. Haber10’s headline read that I am the right-hand man of the “terrorist leader.” Hakikat Perver says that Gülen’s money safe “exploded”, in reference to the safes and me. All of the stories emphasise the name of my alleged villa (“Nur Konağı” in Turkish, “House of Light” in English) as further “proof” of the “villa’s” connection to me. What is true is that (1) my name is Özcan Keleş, (2) that Ömer Keleş is my father, (3) that my family originates from Aksaray, and (4) that Aksaray is a city in Turkey. Everything else is untrue. I am not Gülen’s right-hand man. I am not influential in Hizmet. I have never lived in the US; the last time I visited was in 2014. I was at home in London on the night of and days following the coup so I was not the person shown with his back to the camera; I did not make my first appearance before the cameras next to Gülen; I have a YouTube channel and have appeared on TV and podcasts since 2008; I am not a “mysterious unknown”; I’m active on social media, volunteer my personal affiliation and identity; am well-known in many groups and circles, including the Turkish-speaking community in London, and have my own weblog. I have a number of law degrees and qualifications and am a Barrister currently studying for a PhD in human rights. I have never owned property in Turkey. The building that was raided is not a villa but a block of five flats; it was not empty but had occupants. It does not belong to me, but my father. My father built it for his ageing parents and in-laws, my grandparents. It is a three-storey building of five apartments; one each for the grandparents on both sides, one for their carers, one for my parents and one for guests. My parents moved my grandparents into their new homes some twenty years ago with carers to live with them and to tend to their needs, while my parents were in the UK. When my parents went to Turkey, they lived there and looked after my grandparents. The last time I was there was in 2013 when I went to visit my sick grandfather, who passed away shortly after I left. Today I have one surviving grandparent, who was being looked after at that building that was raided. The name of the block (House of Nur) is a reference to the fact that in Islam the elderly are considered to emanate “nur” which means light. As for the safes and other allegations. My father had a safe installed for each of the five apartments and an extra one for his apartment. My grandparents kept their valuables there. The safes were empty because three of the four occupants of the apartments had passed away. Had they been alive, the police would have discovered their pocket money and valuables. My father was the legal owner of a licensed firearm. It is not uncommon for wealthy people in Turkey to keep one as a deterrent in their home. The house is not mysterious and does not have any secret rooms. In fact, the house has hosted many AK Party supporters and government officials. My father is not the Hizmet movement’s UK “imam”; he is not even a “Hizmet sympathiser”; he has not attended a Hizmet fundraising dinner or sohbet for at least five years. He has always been critical of Hizmet. He is very well known within the North London Turkish-speaking community and many, including AK Party members, can attest to his affiliations and his views. His closest group of friends are all AK Party supporters and many have official roles with the UK branch of UETD, an AK Party-supporting group. He has consistently voted for the AK Party, even after it turned on Hizmet. In the past, as one who supports worthy causes regardless of the group behind it, my father has donated to Aziziye, Suleymani, Diyanet and Mevlana mosques in London and other Diyanet mosques and maasjids in Turkey. His most recent project was donating to and personally working on the construction of the Diyanet mosque in Hornsey. My father and family are being unjustly targeted because I have written and spoken on Hizmet and Turkey. Previous PostWhat are Gülen or Hizmet-inspired schools?